there are days when things just come to you. i was about to leave on another bee escapade one afternoon when Joe comes over and tells me there is a swarm in front of his apartment. plans were changed, our friend Erik was summoned and very quickly i was propped on a ladder against the zapote tree holding a box below the very gentle bees you can see in the picture above. Erik directed the whole operation and it lasted about an hour. swarming bees are usually quite peaceful since they don’t have any honey to protect. swarming bees are also in a very fragile state. they have a window of days to find a place to call home (hive?) before thee food reserves in their stomachs run out and if it rains they are screwed. 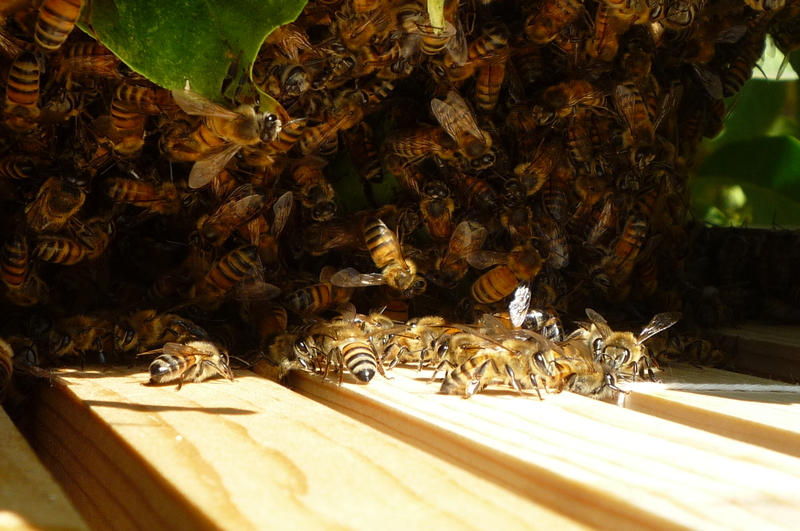 capturing a swarm is quick and easy compared to doing “cut outs” (literally cutting a hive and putting it into a box) and doing “trap-outs” (trapping bees out of a place where the comb is inaccessible to the beekeeper) but the chance of success is also lowered. the swarm can decide to fly away -after all they are looking for a place they like- and sometimes even if they decide to stay in the human managed place the beekeeper offered there is the risk of the virgin queen being eaten by birds when she ventures out to mate. 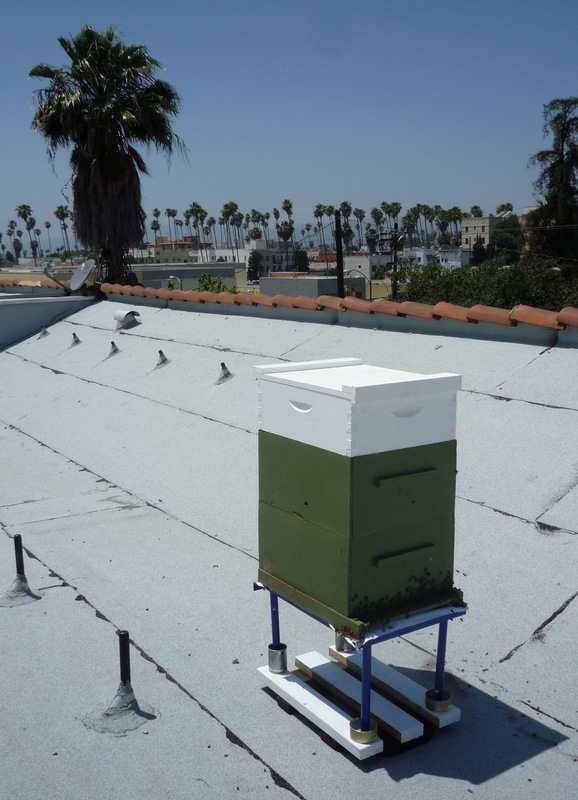 for more info on “cut outs”, “trap outs” and swarm captures head to the backwards beekeepers blog. if you want to see more pictures of this capture check out this picture gallery. 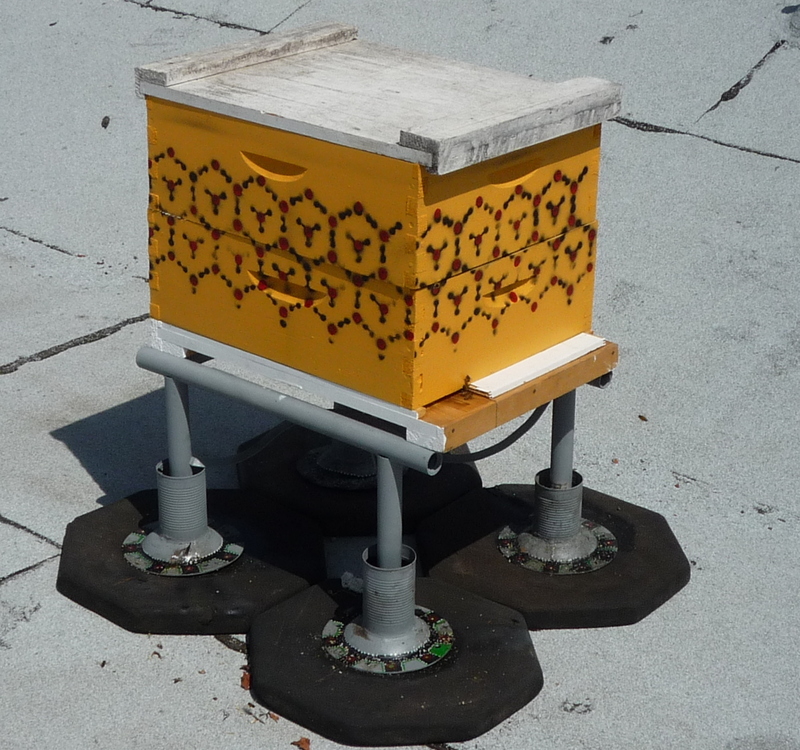 after two weeks we transferred the frames inside the nuc box to a larger permanent home. the bees were very active and had drawn about three half frames with comb. they were feestooning (“a lacework of bees hanging together, leg-to-leg”) which is quite amusing to observe. here is a picture of their new home. i’ve been playing with a hexagon pattern stencil (utter bee-feverish) and this time i used four hexagon shaped rubber feet. i welded the stand with random scrap metal parts. i’m a bit dubious about the way i implemented the oil cans, still working on that.